Do you always shop from the same store or are you on the hunt for the best deals and don't mind trying out a new shop? My mom and I have a couple of our favorite go-to stores that we shop from. However, we also like a good deal, so we don't mind brightening up our horizons and giving others shops a chance. After all, if we didn't we wouldn't have came across Lotte, which has undoubtedly became a new favorite of ours. By the way, my mom and I like to haul together, do you like to haul with someone else too? 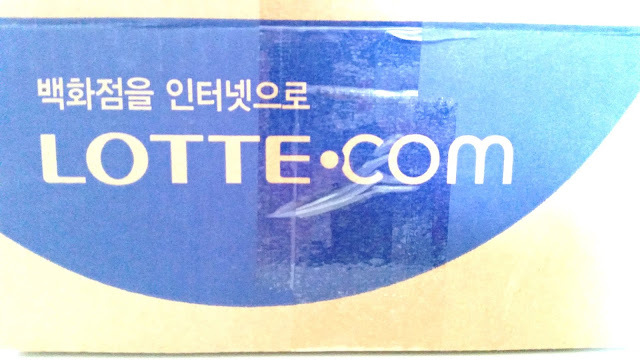 Mom and I have known about Lotte for a while now, but didn't try shopping from their site until recently. I think our first encounter with Lotte was over 12 years ago when we went to Lotte World. I was little then and Seoul was this place full of yummy food, interesting places and Lotte World was fun and I remember wanting to stay longer. Anyways, I don't know how long the Global Lotte site has been around but I am sure glad it's here because they always have some amazing deals. It's worth it if you wait for their Free EMS deals, because you can get those goods at a good price with free EMS shipping! 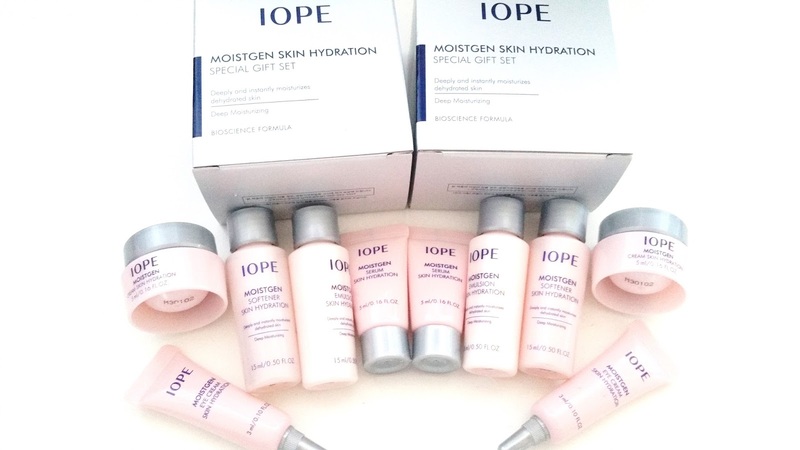 In case you are wondering, we did take advantage of one of their Free EMS deals and got this Iope cushion set you see below. This is an amazing set at the cost of only $35. It came with Free EMS shipping too which means it got to us fast. 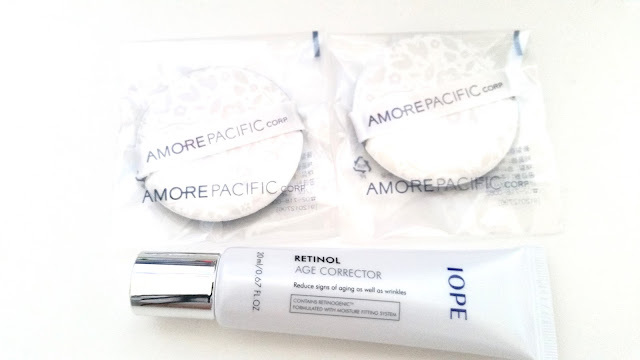 This set comes with the IOPE cushion (we chose the N23 shade), 2 refills, 2 sets of deluxe samples, 2 extra puffs and a deluxe sample of their Retinol Age Corrector. 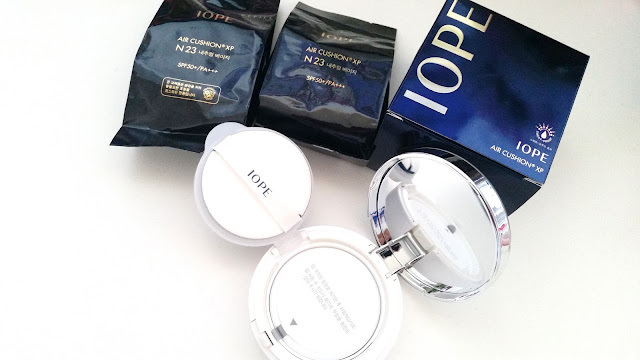 My mom and I have been wanting to try the IOPE cushion for a long time now. It only seems fair to try out the brand that started the cushion trend while we are on the hunt for the best cushions for us. We got the IOPE Air Cushion XP in shade N23 because it's the shade that's closets to our shades. I have a feeling the N23 is going to be a tad darker for me and a tad lighter for my mom. However, we shall try it out and decide. Since this set only came with 1 case, I know I will be reusing one of my past cases with a refill. For the price, this set is so worth it. For some shops this price can only get you 1 cushion and 1 refill, so having 1 cushion and 2 refills plus a bunch of samples is awesome! The samples in this set are real. Now this is service (service means free stuff in Korea). On the Global Lotte shop, you'll see directly in the pictures if it comes with any samples. I didn't get more samples than the ones pictured, so I think it's a what you see is what you get type of thing. Which is fine with me because this is still a lot more samples then if I bought the IOPE cushion from somewhere else. These 2 sets of samples are the Moistgen Skin Hydration Special Gift Sets. They are exactly the same and it comes with like an entire routine. It's got softener, emulsion, serum, eye cream, and face cream. I think I will review these during Sample Saturday once I test them. Here are the rest of the freebies. Mom called dibs on the Retinol Age Corrector, so that will be hers to test. She'll also review it for Sample Saturday once she's tried it. I am super happy that the set came with extra puffs. I hope these will last long and endure the washes it will no doubt go through. On a side note, the puffs are really pretty. They've got a floral patterns on it and it looks cute. Overall this is an amazing set and an amazing price. I am so glad we went on ahead and purchased it. I know we will be purchasing from Lotte again for sure. 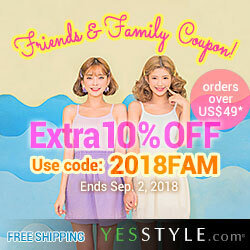 Lotte seems to have Free EMS deals quite often, although each time it's only for a set amount of items or certain brands. So if you are willing to wait for the right deal, the items you want might just become a free EMS deal. They are currently running a free EMS deal right now to welcome the New Year. The deal ends Jan. 18th, 2016. 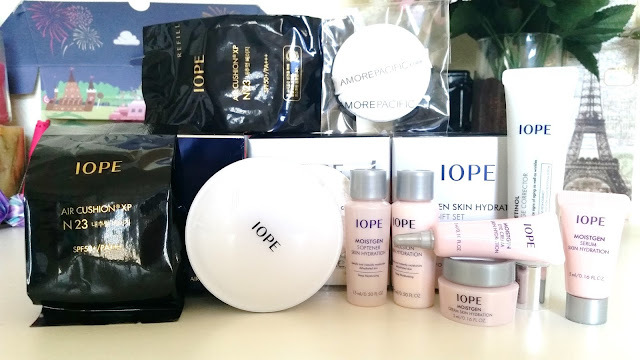 It's worth checking it out, they've got brands like IOPE, Laneige, Dr. Jart+, It's Skin, SNP, Sooryehan, etc.